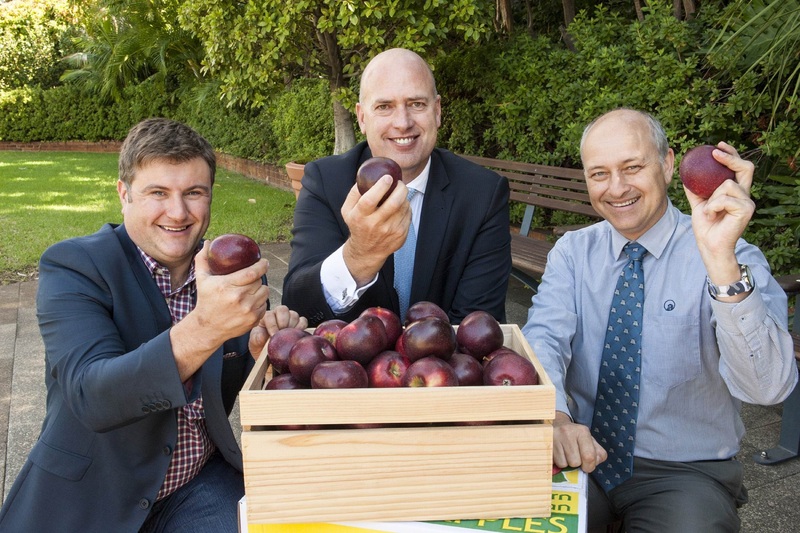 WA grower Mario Casotti, Agriculture and Food Minister Dean Nalder and Department of Agriculture and Food Horticulture Director David Windsor with the new locally bred apple Bravo, distinguished by its rich burgundy colour. “Bravo offers an exciting new choice for apple lovers, and is the result of more than 20 years of commitment by Western Australian apple breeders,” Mr Nalder said. The new apple was developed in Manjimup by the Department of Agriculture and Food WA as part of the Australian National Apple Breeding Program, and is grown from the South-West up to the Hills, as well as interstate. The apple is from the variety ANABP 01, which is a cross between Royal Gala and the well-known WA variety Cripps Red, known as Sundowner. “While quantities of the fruit available this year are relatively small, larger supplies will be available in coming seasons as recently planted trees mature,” Mr Nalder said.